I was starting to get bored in my ground blind, I had only been in it for 3.5 hours and decided to peek my head out of a shooting window and get a breath of fresh air. I looked below the bait site and could not believe what I was seeing, 30 yards below me was a black bear walking right at my ground blind, my timing could have been better. This hunt started in mid April with me trying to take a bear spot-n-stalk on the breaks of the many rivers here in Idaho. We didn’t have a big snow year and I was able to get into areas that I usually couldn’t get into until the first of May. I decided to do a few day hunts, then when I had time I would do some overnight backpack hunting. My first day I got up to the top ridge I wanted to walk out to start glassing when I looked down and couldn’t believe what I was looking at, a fresh elk shed. I hadn’t even removed my backpack and I already had something to haul out. I would like to tell you I just concentrated on spotting bears every minute I was out there, but that wouldn’t be true. I found myself trying to spot other sheds that had been dropped. When I walked out that night I didn’t see any bears but I did have nine elk sheds strapped to my backpack. Finding all those sheds gave me an idea, my good friend Nick Hill and Kelly Lupton (lumpy) were going to be going near where I was that weekend. I talked to my wife and decided to have them drop me off on the top of a huge drainage and she would pick me up on the highway next to the river a day later. I loaded up my bigger backpack and see if I could find some of the bears I had seen in the past on that ridge, and maybe another elk antler if I was lucky. When I reached the highway Sunday night empty handed I had a smile on my face because I had a great time trying to locate a bear. I realized my shed hunting luck had run out and I needed to start thinking about rounding up bear bait. I watched the snow line and patiently wait for it to melt. I took several more trips to different areas looking for a good bear to stalk with no luck on bears or shed antlers. The only luck I had was bad when I took my shovel out the night before to clean up the back yard and forgot to put it back and got stuck in a snow bank, that was a long day. I did learn a good lesson and made sure my shovel was in my jeep. When the snow finally let us get close to our bait site’s we started hoarding all of the bait we could get our hands on. On May 19th Lumpy and I loaded up our trucks and set up a base camp to work out of for the next 4 days. On the 20th Nick came up with Lumps son Matt and his dad Tim and brought us more bait, help set up a bait station and hauled out all of our empty barrels. On the night of the 22nd we had five bear baits in and ready to hunt when the bears started to get regular. 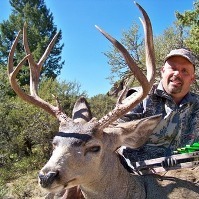 June 6th a friend of mine Mark Jost came in from Iowa and was going to stay till the 14 to hunt with us. My wife Kris and I arrived at camp June 4th and set up camp. All I could think about was checking the baits, I went to the one I set up for me (all thread) and it was not hit, I was disappointed but I knew it wouldn’t be long. I went to check the bait Mark was hunting (Dead Cinnamon) and it was tore up. We were in business. I decided not to check the other 3 bait sites; Nick and Lumpy would be up to hunt them regardless of their activity. The first few nights Mark was seeing bears, but he was holding out for a nice cinnamon colored bear. He hunted every day and seen a total of six different bears. He spent the first night in the blind but thought he would have a better vantage if we put up a tree stand and took down the blind. The next morning about 11:00 am we snuck into the bait and put up a tree stand and sprayed the area we were in with a scent killer and left the area as quietly as possible. He had a nice P&Y black one come in several nights and layed on the bait and offer him every shot possible, it just wasn’t the bear he wanted to shoot and decided it was color phase or nothing. He did watch a bear that had the color he was looking for circle the bait but kept watching his back trail as it disappeared over a little finger ridge he could see from his stand. Ten minutes later Mark watched two wolves follow the exact trail the bear was on and go over the ridge, he gave a little lip squeal and one of the wolves stopped and came back to the top of a little finger ridge and stared at the bait site. I sat the first few nights and “all thread” was starting to show some signs of being hit. I was glad to be in a blind on my first three nights of hunting. We had rain and or hail every night. I was hoping Mark was dressed for it. The third evening when I was sitting I had a thunder and lightning storm come over me and I thought I was toast. The thunder was so loud I swear it moved me every time it sounded off. I didn’t know how smart it was to be there in my Double Bull blind with the storm going on, but I thought if I got out I would be struck by lightning for sure. I said my prayers, and waited for the most terrifying 5 minutes I can remember. On the forth afternoon the weather looked clear, I sat up my blind about 23 yards to the side of the bait about 4:00 and settled in for evening of swatting mosquitoes and keeping an eye out for storms. I had sat about 3.5 hours when I stuck my head outside the blind and seen a bear walking up the bottom. I wasn’t ready yet. I got ready as fast and quiet as I could and looked out, the bear was standing next to the barrel. I pulled my bow back and put my 20 yard pin a little high and leveled off my bow, the shot looked great, the arrow went through the bear right behind the shoulder and hit the barrel. The bear took off like a race horse for about ten yards and its head dropped and it started rolling. It went all of 15 yards and landed on a log that worked perfect for photos. As soon as I got him back to camp, Kris and I got it processed and ready for a trip to the cooler in Nampa. Lumpy went to check one of his baits he set (3 Moons) and it was tore up as well. He sat the first night and didn’t see any animals. When he went into the bait on the second night his son Matt spotted two wolves about a hundred yards from the bait. He set up his blind and was hoping a bear would come in, so his son Matt would get a crack at his first big game animal. It was not in the cards and Lumpy would have to go back to work. I asked Lumpy if Matt could stay with us and I would take him out every night until season closed. Lump said sure and his wife Carrie would be up in two days to sit a night with us. The first night Matt and I sat we had a coyote come by the blind but not the big bear he had hoped for At 8:00 a nice chocolate came in and Matt decided to pass it. I couldn’t believe he would pass that bear but he wanted one a little bigger, so I took a few photos and got the bear on video. The next night Carrie came up and all three of us got in my blind and started the wait. We were glad to be in the blind that night because of the rain, it didn’t stop the whole night. About 7:00 a small chocolate showed itself for about 5 seconds and then backed off into the brush. At 9:00 a bigger chocolate showed up and Matt decided he wanted to shoot, he took his time and waited for a broadside shot, he made his shot count and the bear went all of 20 yards. We were all excited for Matt and his first animal. We took a few a few minutes to relive the hunt and get a few photos. I am already excited for next year, I can’t wait to see how many sheds I pick up during bear season. 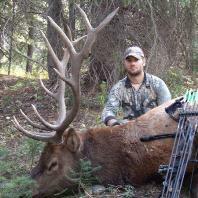 If you are considering a hunt in Idaho you will have a lot of opportunity. The best advice I can give you is do not commit yourself to only one method of hunting. While I was waiting on the snow to melt I took advantage of that time and did some spot-n-stalk hunting. I would of just waited for the snow line to recede I would have never found the elk sheds I did. Even though I didn’t take my bear by spot –n-stalk I still had a great time and can’t wait for next year. Most of the units open April 15th and a couple as early as April 1st. Some units can run as late as June 30th, which is plenty of time to give you a chance at a bear. Go to www.fishandgame.idaho.gov for more information. My family and I have come to enjoy bear meat, in fact it is one of our favorites for burger. We take the bear and de-bone it and cut out all of the fat and sinew so it is as clean and pure as possible. We then take it to the butcher and he weighs it and adds 7% pork suet and 7% beef suit to it and grinds it up. It is some of the best burger you will find.